This weekend, Florida Gov. Rick Scott issued a call for about 1,000 nurses and medics to work as volunteers at the state’s special needs shelters operating in the aftermath of Hurricane Irma. Nurses who can volunteer can email BPRCHDPreparedness@FLHealth.gov. Nurses can also email HelpFL@FLhealth.gov. I cannot stress enough the importance of our profession in times of disaster. 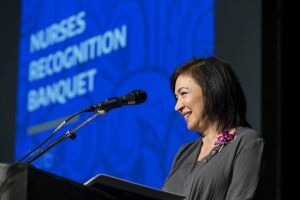 Nursing’s dedication to health promotion, disease prevention and the highest quality, compassionate care for all people becomes more crucial than ever. Thank you to all members of the UW School of Nursing community who are able to lend their expertise to these relief efforts and those associated with Hurricane Harvey. You have my admiration and appreciation. My thoughts are with those affected by these recent catastrophic events.